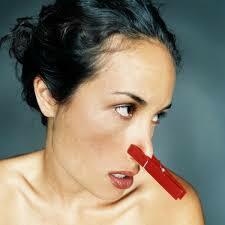 Clipping your nose is one crazy tips for losing weight. Weight loss is a funny topic as there seems to be some surprising tips for losing weight. Some tips mentioned here are least expected to help with weight loss, but surprisingly does. Curious to learn more? Read on. Did you know that drinking oil can help with weight loss? This is the fundamental principle of the Shangri-La Diet which says you can lose weight if you drink either 1-3 tablespoons of sugar water or1-2 tablespoons of extra light olive oil twice every day in between meals. The pioneer of the diet, Seth Roberts states that the diet curbs your appetite and in the process, helps lower your body’s set point or the weight it naturally wants to settle at. His logic is your brain stimulates hunger when you eat various familiar, flavor-rich foods. This in turn raises the set point and leads to weight gain. However if you consume foods which have little or some unfamiliar taste, it makes the brain think that the body is starving which in turn lowers the set point to induce weight loss. Adding various flavored spices to your food helps control your portion sizes and thus lose weight. This is because research proves that people tend to eat less when the food they eat tastes new and spicy; perhaps it’s because you are forced to pay attention to it. In fact, the crazier is the blend of spices used in the dish, the more novel is the dish’s taste and the more benefits you reap. So if you have always liked spices, don’t hesitate to go out of you comfort zone and do some experiments. Moreover, spices like turmeric, cumin and cinnamon have the added benefit of having powerful antioxidants. If you love cooking, and have a habit of tasting the food as you go by licking, sipping and nibbling, all the food you eat while tasting adds up fast. This can leave you feeling as if you’d eaten a meal before it even reaches the table! So to cut the tasting urge, experts recommend tips for losing weight of sucking on a highly flavored candy while cooking. Not only will the sucking keep your mouth occupied, its potent cinnamon, sour or mint taste will keep your taste buds busy. It’s a known fact that smell affects how you taste your food. It’s proven through an experiment where if you kept your nose pitched and ate an apple and an onion, you actually couldn’t tell the difference. So though it may look weird in restaurants, and it may make your favorite foods less enjoyable, clipping your nose shut during meals helps you eat only as much as required to get full. These 4 tips for losing weight may look weird, and actually are. This is because some weight-loss strategies may work for some people and not for others. So it’s left to you to try them out to find out which strategy works for you and your body type.